BS Podcast: Is a slowdown coming? How's the Indian growth story looking? What really is happening? Lets examine some key parameters in this podcast. China is slowing. Germany is stuttering. Brexit has shadowed Britain’s economic future.The growth in eurozone and Japan is anemic. The world was looking to India to shepherd global growth. Industrial growth in January slowed to 1.7 per cent from 2.6 per cent in December last year. This has led to fears that the fourth quarter of this fiscal year may be as sluggish as the previous. This means Indian factories are just not manufacturing enough goods. That, in effect, will have a deleterious impact on employment in the country. Then there is overall GDP growth. The third-quarter GDP numbers showed that growth was slowing. India grew at 6.6% in the third quarter of this year – the lowest ever in the past five quarters. India’s GDP growth projections for the entire year have been reduced to 7% from 7.2%. Again, not good news. When OPEC sneezes, India invariably catches the cold. The Modi government was lucky to have been in the middle of slumping global oil prices during its first three years in power. But that luck is running out. Global oil prices are rising again. Iran is being squeezed by the Trump administration, which will further hurt global crude prices. This means higher diesel and petrol prices in India, which in turn will have a cascading impact on inflation and hurt consumption. This, in turn, will negatively impact growth. To further add to this gloomy picture are slowing investments. Data from the Centre for Monitoring Indian Economy showed that investments in the December quarter fell to a 14-year low. Investments by private sector fell in all sectors in India. What’s worse, government spending on infrastructure is also contracting. 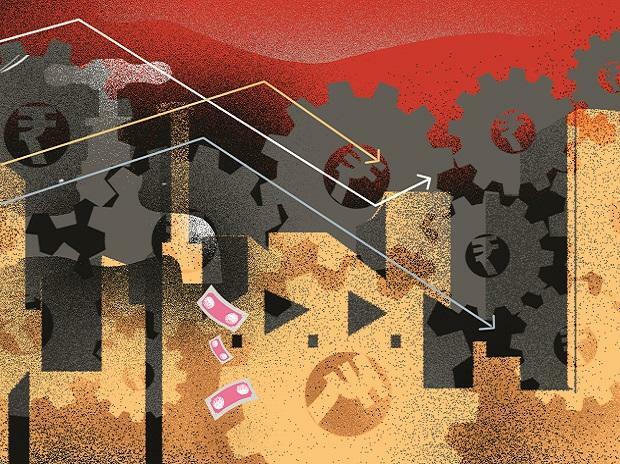 And with elections around the corner and political uncertainty, there is likely to be paralysis in future spending decisions of the government and uncertainty among corporates on whether or not to invest in such a political climate. Other signs of distress are quite high as well. Small and medium industries continue to suffer; core sector growth is at a 19-month low, and third-quarter profit growth among big corporates was at a much slower pace than earlier. India’s largest carmaker, Maruti Suzuki, has reportedly cut production by 26.8 per cent in March 2018-19 because of a slowing demand in India’s passenger vehicle market. The cutback is significant as it comes after at least three years of strong double-digit growth. A combination of factors, including tightening of credit norms by financiers and declining urban sales and slowing rural offtake, has forced every other automobile company to pare production. The automobiles sector is just one example of the slowdown that is gripping the economy. Growth in consumer spending, which accounts for nearly 60 per cent of the economy, had slowed to 8.4 per cent in the October-December quarter, compared with a revised 9.9 per cent increase in the previous quarter, leading policy advisors to worry that the slowdown could hurt the manufacturing sector, hitting engineering, textile and some other labour-intensive industries. It gets even bleaker for India. Latest trade data shows non-oil, non-gold imports contracted for yet another month — falling 3.7 per cent in February, following on from a 0.8 per cent fall in January. An expected deceleration in economic growth in major economies around the world, including China and the US, is expected to hurt trade growth further. So even as the world’s largest democracy goes to vote, its faces massive headwinds and a faltering growth story in the times to come.